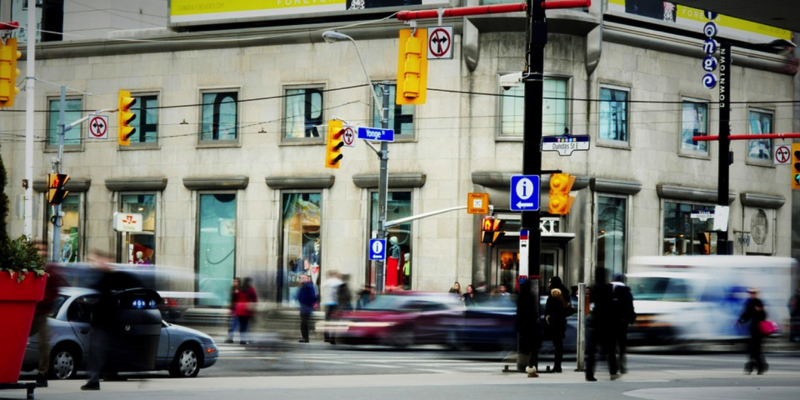 Like many major metropolitan areas in the United States, Toronto is experiencing fast-paced growth. Canada's finance and business capital has more cranes in the sky than New York City—with nearly 50 percent more high-rises undergoing construction than in the big apple. Between 1990 and 2012, the region experienced a doubling of the economy, and significant population growth. By 2013, Toronto had become the fourth largest city in North America and today, almost one fifth of all Canadians live in the metropolitan area. Almost half of all recent immigrants live in poverty. As Toronto's population and economy grew, so did levels of income inequality. Over a 25 year period, household income inequality grew 31 percent—more than double than that of the country as a whole. Between 1970 and 2005, the number of low-income neighborhoods grew from 19 to 53 percent, while the number of middle-income neighborhoods decreased from 66 to 29 percent. Toronto recognizes that it must combat structural inequalities that prevent specific demographics from escaping poverty. 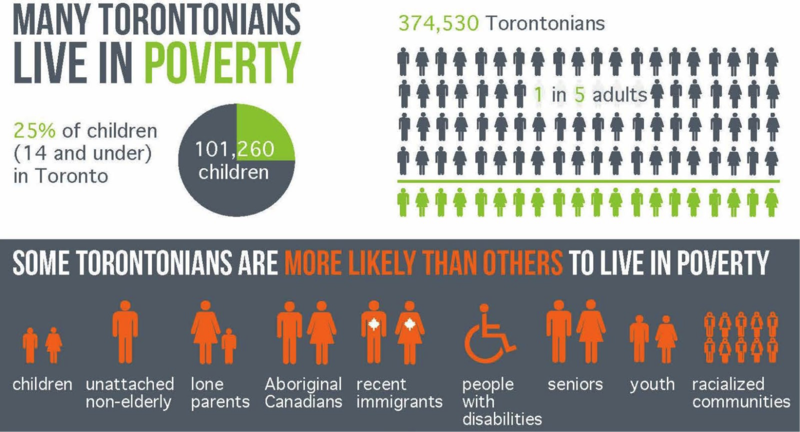 Above are two infographics featured in conjunction with Toronto's report, TO Prosperity: Toronto Poverty Reduction Strategy, a comprehensive endeavor to change the economic paradigm for all Toronto residents. Despite such grim conditions and trends, the City is working toward solutions. 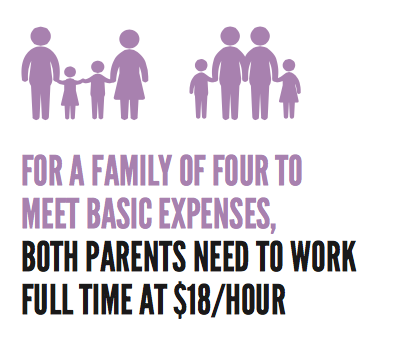 Having reached “consensus that [Toronto] do[es] not want growing inequity, and that a collaborative, community-driven strategy is needed to end poverty,” on November 3, 2015, Toronto’s City Council voted unanimously to adopt “TO Prosperity: Toronto Poverty Reduction Strategy.” The City’s first ever comprehensive anti-poverty plan aims to address some of the most difficult societal issues: rising inequality and the concentration of poverty. The City intends to become, by 2035, “a city with opportunities for all,” in which “everyone has access to good jobs, adequate income, stable housing, affordable transportation, nutritious food, and supportive services.” To do so, the City will follow a groundbreaking new anti-poverty plan, which provides guidance on how it can meet residents' immediate basic needs as well as create more permanent pathways to prosperity. The strategy comes after months of planning, with over 100 meetings in stakeholding communities, 10 facilitated dialogues, and hundreds of online surveys to collect suggestions from those who would benefit most. In addition, a network of more than 75 community groups convened a session called "Commitment 2 Community," in which they outlined their recommendations for the budget allocation in the Strategy's implementation process, which will take place over the next three years, to ensure not just short-term solutions, but long-term success. After consulting with experts and community members alike, the City crafted a meticulous plan to reduce poverty that tackles some of its major symptoms, while also getting at the root of the problem. For instance, the City strives first to ensure that all children have the opportunity to thrive, that wages are held to higher standards for all residents, that families have access to healthy food, and that public transit serves those who depend on it most. Meanwhile, the City's strategy simultaneously echoes the "Community 2 Community" call for systemic solutions. As the report states, "Why expect different results if we continue doing things the same way?" Connect job seekers, start-up businesses, and worker-owned co-operatives with economic opportunities, through collaborations with local anchor institutions. Though the initiative is in its early stages, Toronto is poised to become another leading city that is building community wealth. The City acknowledges that "[e]nding poverty needs an accountable and participatory government that recognizes that everyone has a part to play. Residents, community and business partners, labour, and other orders of government will need to devote time, energy, and resources to build a prosperous and inclusive Toronto." How will the city accomplish this goal? Toronto joins a wave of North American municipalities from Cleveland, Ohio to Richmond, Virginia, piloting and implementing community wealth building policies and strategic actions, from which it can draw many lessons and tactics to combat inequality on a systemic level. Much research has been completed on opportunities to leverage local anchor spending from place-based institutions (such as University of Toronto and Toronto General Hospital) to connect both local job-seekers and worker-owned cooperatives with economic opportunities. Toronto's newly developed strategy also aims to funnel resources from private economic development for community benefit, a growing trend in many U.S. cities. It remains to be seen whether the city will fund this $75 million initiative, but with current advocacy by civic leaders, we remain hopeful.